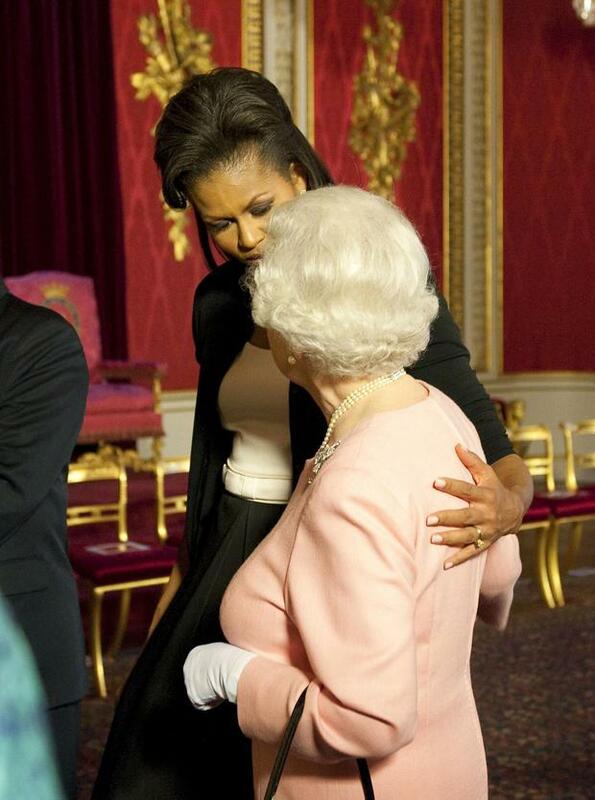 Michelle Obama puts her arm around Britain's Queen Elizabeth II at a reception at Buckingham Palace, London. Former First Lady Michelle Obama has revealed why she and the Queen put their arms around each other during a G20 summit - they were bonding over their sore feet. Eyebrows were raised in 2009 when Mrs Obama was seen to put her arm around the Queen's shoulders during a Buckingham Palace reception, and the monarch responded by putting her arm around the American's waist as they stood side by side. Many publications have reported that at first she was awestruck by Britain's head of state, who she described as an "honest-to-goodness icon". But the Queen, who is famed for her humour - which she uses to put nervous guests at ease, commented on how tall the then First Lady was before highlighting how her shoes must be painful. Mrs Obama wrote: "The Queen then glanced down at the pair of black Jimmy Choos I was wearing. She shook her head. Mrs Obama added that despite their positions, they were just "two tired ladies oppressed by our shoes", and without thinking she put her arm around the Queen in a gesture of bonding. She wrote: "I then did what's instinctive to me any time I feel connected to a new person, which is to express my feelings outwardly. I laid a hand affectionately across her shoulder.